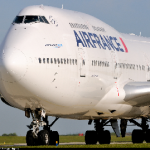 Air France authorises Smartphones and tablets during flights, including take offs and landings. The company explains that on 9th December of last year, the European Agency for Air Security published new legislation authorising the use of mobile phones but in “Plane Mode” only. In effect, “passengers will be able to continue using their smartphones to work and/or entertain themselves from the moment they get on board their plane to the moment they have left the aircraft”, commented Air France in one of their press releases. However, the use of Bluetooth or WIFI will not be permitted. This means that passengers will not be able to receive or send emails, or make phone calls. On Thursday, Lufthansa also announced that from 1st March 2014 it will be applying the new directive. The German company already authorises the use of electronic equipment on board their Boeing 747-8 whilst in “Plane Mode”.